There are definite seasons in the Eastern Solent Area. After a quiet February, the plaice move inshore in March and are caught around The Blocks, Winner Banks, Ryde Sands and south east of Pullar . In April, the bream and smoothounds arrive. Good bream marks are Boulder Bank, Bembridge Ledge and Bullocks Patch. Smoothound can be caught on most marks. From May onwards, there is good tope fishing from the Spoils, Utopia and inshore marks where gullies run between banks. Garfish arrive in late April closely followed by mackerel and scad, which stay until September and are an excellent source of fresh bait. Bass, ray and conger can be caught from spring to autumn, and in recent years the mild winters has meant these species have stayed around all year. Pollack are caught from wrecks and rocky marks, although the inshore fish are rather small. Cod appear from October until January, but numbers have dropped off dramatically in recent years. Whiting still show in very good numbers following the cod inshore. Pout and dogfish are numerous throughout the year. Ray are plentiful and some of the species are easily confused. There is a very useful identification guide here. 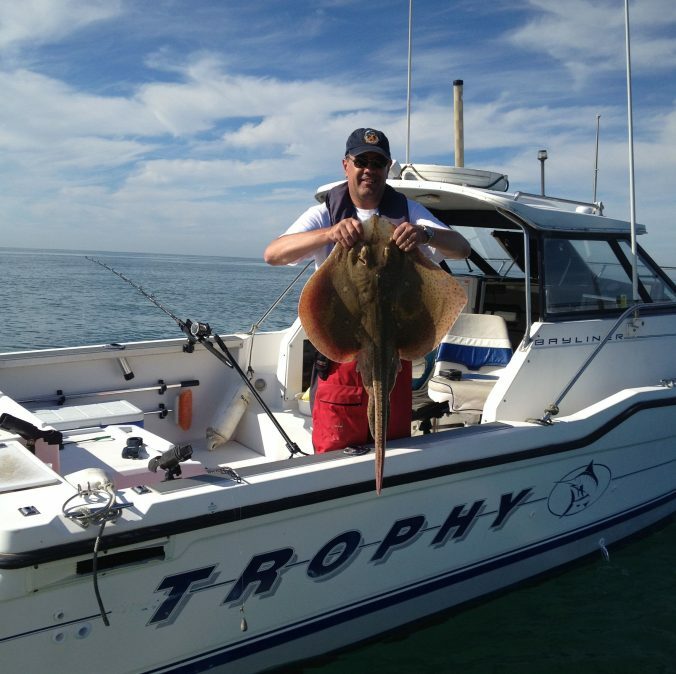 Expect to catch blonde ray on the banks, with thornback, undulate, spotted, cuckoo and small-eyed ray all likely to be caught. Some more unusual species are making an appearance. Trigger fish are often caught, and giant sunfish or opah are occasionally spotted. Thresher shark were more common but are still around if you want to search for them. Don’t mistake our resident dolphins for shark, we have some that occasionally come right into Langstone Harbour, which is a wonderful sight. 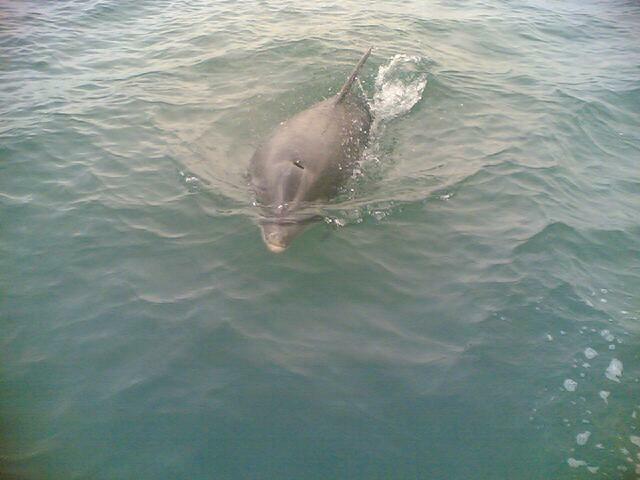 This photo was taken by Arron Shons as the dolphin followed his boat into Langstone Harbour entrance. The best fishing months are probably late April to June, and October to December. You can still catch in other months, but February is probably the worst unless you push well offshore and hope to find pollack on the channel wrecks. Some bonus catches can be large edible crabs and lobster. There is a very large population of spider crabs which make good eating, however they have a knack of cutting line with their claws so if you reel in and find the line bitten through without feeling a nibble, it was probably a spider crab. You may also catch a cuttlefish. If you do, be careful of the beak, which can inflict a very nasty bite. They also squirt black ink which can make a real mess of a white cockpit!